Giant Hand of Vyrnwy – Comprising of a single giant hand in an existing tree stump. Height – 50ft total including tree stump. 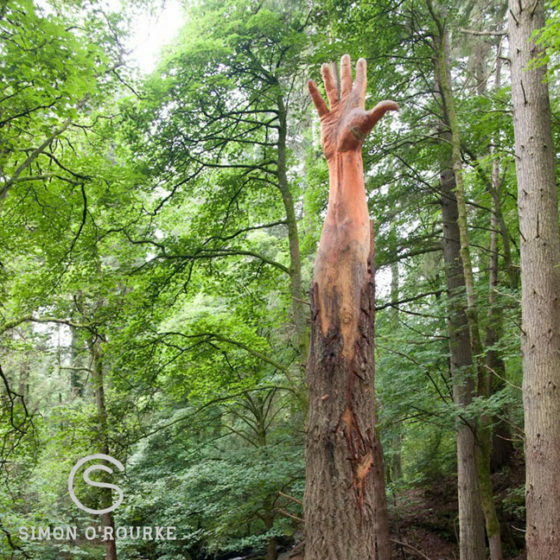 I found out through a friend that the tallest tree in Wales had been storm damaged and was due to be felled, and that Natural Resource Wales who were in charge of the site, were going to commission an artist to carve the tree. I searched the internet for the right person to talk to, and on finding them, I got permission to submit a design! I was really excited at the prospect of carving this giant and creating a memorial for such a well known landmark! I began researching the area and found the area of woodland that contained the tree was known as the Giants of Vyrnwy. This got me thinking and I decided on a giant hand, symbolising the giants, and the tree’s last attempt to reach for the sky! My designs were chosen and I immediately got to work planning. Scaffold was needed to make it safe to work on, and the terrain was such a difficult one that it took two days to erect the scaffold! Six days of intense work followed using chainsaws and grinders. I needed to add two pieces for the thumb and little finger, as the tree wasn’t wide enough to form the whole hand. After completion, the sculpture was coated in Tung Oil, a natural plant based oil safe for proximity to waterways. The client was really pleased with the result and said that it was a fitting reminder of the tree. 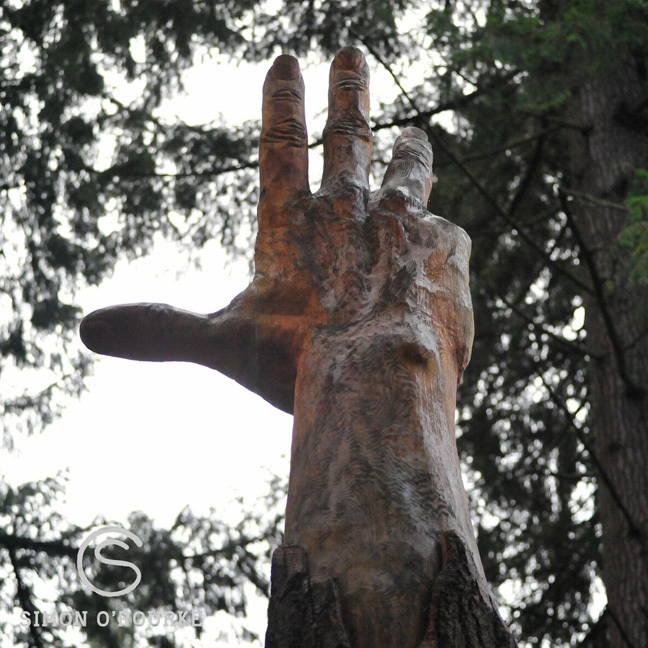 I loved working on the hand sculpture, it reminded me just how small we are compared to some of the living organisms on this planet! All in all, a humbling experience!